Here comes Easter! 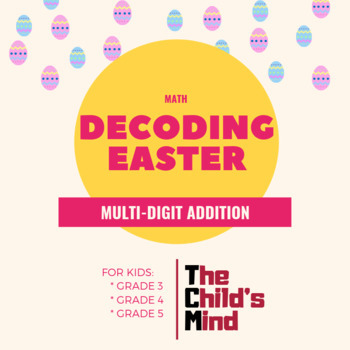 Decode Easter phrases through multi-digit addition. 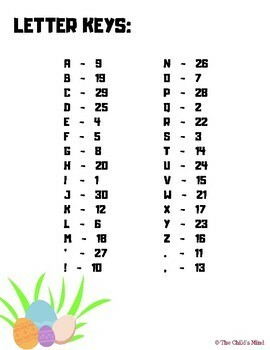 This contains 3 different phrases for students to solve. Colored, black and white version is included. 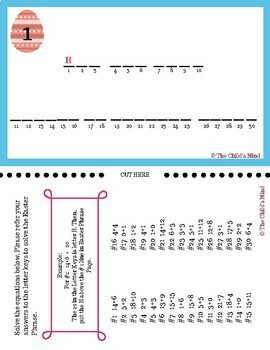 Print the Easter Phrase Page and the Letter Keys Page. There are 3 Easter Phrase you can choose to. You can print one or you can print all three. Let students solve the equations. 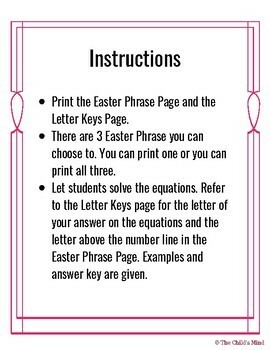 Refer to the Letter Keys page for the letter of your answer on the equations and the letter above the number line in the Easter Phrase Page. Examples and answer key are given. Feel free to follow me to get update on new products!